After a few years away, the US/UK outfit Legion return for their ninth album in nine years. Technically, they actually split up due to mismanagement (which could mean anything but I'll hazard a guess and say it's probably the record label) and possibly listener indifference too. To be fair, there's a lot of music out there for consumption, and even us folk at GDM can't get to every new release. It's just impossible. These days we have to cherry pick. 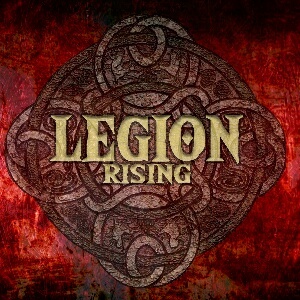 Of all the PV band projects, I would conclude that Legion is the heaviest and that the guitar work of Vince O'Regan is responsible for this tag. I've reviewed a couple of their albums previously and had to go back and see what I wrote as a familiarisation exercise. So what's up on 'Rising'? Well the first track 'Nothin' To Me' is a fiery introduction of battering ram proportions. No delicate melodies here, nosiree. We power directly into track 2: 'Full Moon Rising', an excellent track, and I had to question why I had Extreme's hit single 'Kid Ego' on my brain when listening to this. It's pretty good. 'Maybe Now' straddles the hard rock/metal fence and displays all the attributes from either side within its run time. If the intention was to borrow from modern British metal as on 'How Does It Feel' then the mission succeeded. O'Regan has obviously knelt at the altar of John Sykes. All good by me. 'Got A Line On You' is next, a stomping rocker with restrained verses. It's followed by the aggressive tone of 'Politician', there's a few around the planet with the crosshairs on them. I love the line 'I won't miss you when you're gone'. The well worn song-title 'Only The Strong Survive' features a familiar guitar tone ('New Girl Now', Honeymoon Suite) but that's where the similarity ends. Strong is the optimal term for this track. I love the riffs and tone on 'Shame On You', a song aimed at a protagonist that is no longer in the good books. Phil, Vince and the boys are on fire here. 'Found Out The Hard Way' features more groovy riffing, perhaps borrowing from the bible of one George Lynch? The finale is a slow burner called 'Lost Soul' which takes us out on a cool and mellow vibe. Like anything worth it's salt, a band like Legion is hard to put away for good. Sometimes taking a break and recharging the batteries is all it takes, plus dispensing with misfit record labels. There are solid moments throughout, highlights for me include: Full Moon Rising, How Does It Feel and Shame On You. Welcome back Legion. Bring on v 2.0!